From the Navigation pane, click the down arrow next to the text box and choose Find Advanced. The Find and Replace dialog box opens. 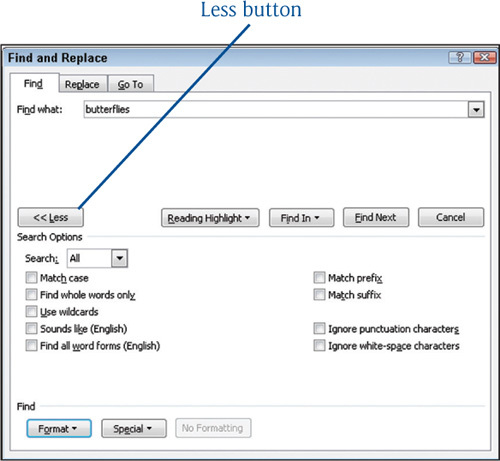 Click the More button which expands the Find options, as shown in Figure 3. The More button turns into a Less button. Some of the options here are similar to those you viewed in the previous section. Figure 3. Expand the search options. Click the Format button. You see a list of formatting options. Click the formatting type you want to locate. Choices include Font, Paragraph, Tabs, Language, Frame, Style, and Highlight. A dialog box appropriate to your selection appears. In Figure 4 you see the Find Font dialog box. Figure 4. Searching for formatting. Select the formatting you want to search for and then click OK, which returns you to the Find and Replace dialog box. Instead of choosing font options from a dialog box, you can press a formatting shortcut key such as Ctrl+B for bold. In the Find What text box, enter the text you want to search for. Or if you want to find the formatting only, regardless of the text, leave the Find What box empty. Specify any other search options and click Find Next to begin your search. Click the Cancel button when you are finished. Click the No Formatting button to remove any formatting specifications. You discovered that Word hides many characters, such as the dots used for spaces, or an arrow for tabs, or even the paragraph mark § at the end of a paragraph. You can have Word search for a number of special characters. From the expanded Find and Replace dialog box, click the Special button. 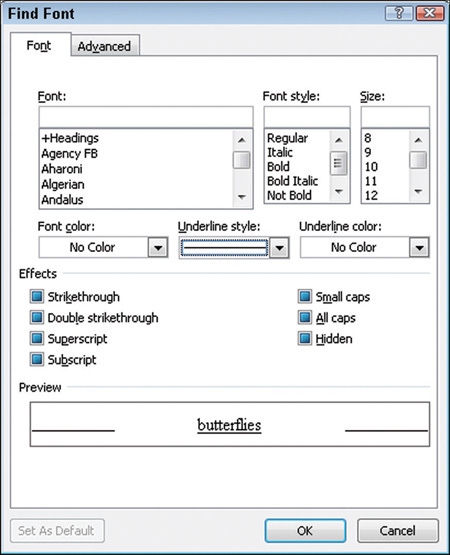 You see a list of formatting options, as shown in Figure 5. Choose the special character for which you want to search. 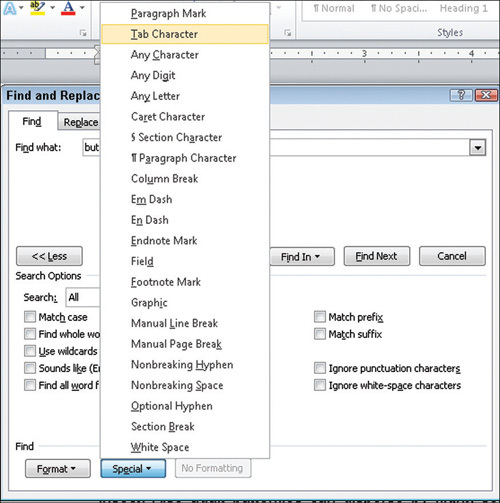 Word places a code for the character in the Find What text box. Specify any other search options and click Find Next to begin your search. Figure 5. Searching for special characters.